Forget the market research, we’ll just hire an ex-CIA agent! As Inc. Magazine reports in Spy Games, companies are increasingly using stealth methods used by the likes of the Central Intelligence Agency (“CIA”) to conduct research on their competitors. While aggressive competition is good for the market, the question remains whether such tactics end up in a race to the bottom. Rather than focusing on improving product or service quality, these companies try to out sleuth one another, only to likely find out they are hiring the same former CIA talent. The plot seems oddly similar to the Twilight Zone episode called Mr. Denton on Doomsday. 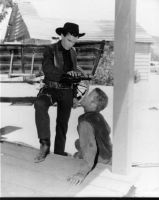 In the episode, gunslinger Al Denton is given another chance to be a top flight slinger by salesman Henry J. Fate. Fate offers Dent a potion that will guarantee to make Dent the fastest gunslinger in the West, but only for ten seconds. Denton swallows the potion when has to face Pete Grant, a younger gunslinger, in a duel. Denton is the company who hires the ex-CIA agent. But, to Denton’s surprise, the younger Grant is holding an empty bottle of the potion. Grant is the competitor who has also hired the same ex-CIA agent. In the end, each man has the same potion induced ability and shoots one another in the hand. The shots disable them both for the rest of their lives. Fate, the salesman, rides off into the sunset. Perhaps those companies in the marketplace who are keen on regularly using sleuth tactics to get the upper hand on others will find that they are being played against one another by the former CIA agents the companies hire. These ex-agents owe no fiduciary duties to their new employers and either go to the highest bidder, or service several at the same time, just like Fate. In the end, these companies are left no better off than where they started, and sometimes worse off due to the opportunity costs. They have may have expended valuable resources searching for the potion, rather than finding and practicing new gunslinging techniques or, failing that, hanging up the gun for another more prosperous service market. Raj: the new Gordon Gekko? Recently, Mr. Raj Rajaratnam was found guilty of violating insider trading laws, which seek to ensure that all members of the trading public, regardless if they are large or small, rich or poor, receive exactly the same information. The goal is worthy, but is it realistic? Whether we like it or not, connected people get better information, just as super connected legacy children get into Harvard. At the very least, the government should make insider trading rules less ambiguous so as to not make every aggressive trader, like Mr. Rajaratnam, into a potential poster child of the new Gordon Gekko. Various scholars, including Yale Law School’s Jonathan Macey in Deconstructing the Galleon Insider Trading Case, point out that the Securities Exchange Commission (“SEC”) has a more expansive and ambiguous view of insider trading than the U.S. Supreme Court. On the one hand, the SEC takes the view that everyone in the marketplace should have access to the same information, regardless of the effort they take to obtain it. As a result, non-public information should never be traded upon, regardless of how you get. On the other hand, the Supreme Court says having special access to non-public information is legal so long as you didn’t commit a crime to get it, such as when your lawyer steals your confidential information and trades on it. The SEC’s ambiguous insider trading rules have given it more unfettered discretion as to when to lower the gauntlet, and on whom. This is dangerous. As Mr. Macey points out in his article, much of what companies disclose in their filings is so watered down because of regulatory concerns that they leave you wanting to know the “real story” via other means. Like a good reporter, you may be able to get your hands on the scoop by interviews, or otherwise, whereas others are not. While the efficient market hypothesis posits market prices reflect all available material information, we all know this is not reality. Until that happens, which may be never, the SEC should develop a bright line rule more in accordance with the Court’s rulings so that folks can be aggressive in making good connections for much needed information without ending up in jail. The gut is sometimes more reliable than the mind. As reported in U.S. Rolled Dice in Bin Laden Raid, the green light to eliminate Mr. Osama Bin Laden eventually came down to “gut instinct.” While we all understand the role of numbers and rational thought in business decision making, we think that the West sometimes places too little emphasis on what can oftentimes be your best friend in uncertain times: your gut. As we all know, there are times in business when the numbers tell the whole story. There is no gray area. There is no need to use your intuition to make a decision. And yet many decisions in business are not so black and white. For one thing, the numbers may be cooked by the seller of the stock you are thinking about buying. You may not know this by looking at the numbers, but may intuit it by feeling out the underwriter or broker. Like the Navy SEALS in the picture to the left, your eyes may not see anything behind those trees in your midst, but sometimes your intuition will tell you something is lurking there. Unfortunately, the West sometimes places too much emphasis on rational thought, and not enough on the value of intuition, a point that Mr. Nassim Nicholas Taleb makes in The Black Swan: The Impact of the Highly Improbable. Perhaps this is because of a reductionistic approach to studying decision making taught by many schools in the West, including the Economics Department at the University of Chicago, which oftentimes attempts to reduce the complexity of human decision making into mathematical equations. While this may be a helpful crude tool to understand a complex system, it is is not sufficient. Due consideration also needs to be placed on the role of intuition — the gut — in making good decisions.